I was delighted to find this company at a trade show in Scotland. Roberts and Sons had the nicest thistle design we have ever seen. The owner Ian Roberts is also one of the more enjoyable person you will ever meet. I like doing business with people I know personally as it gives me a better idea of the quality of goods and the direction the company is taking. So many potteries have left UK that I also like supporting those that have chosen to stay. When you purchase products still made in the UK you are helping to keep alive a rich history that goes back hundreds of years. Fine Bone China tea for one. 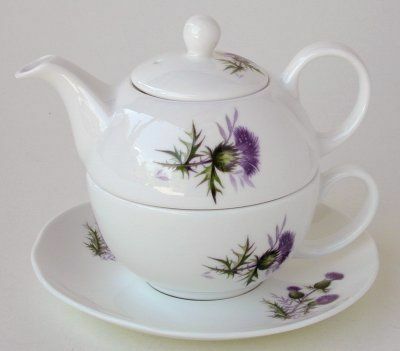 A beautiful thistle pattern bone china tea for one by Roberts and Sons. Made in Scotland. Fine bone china 4 cup teapot. 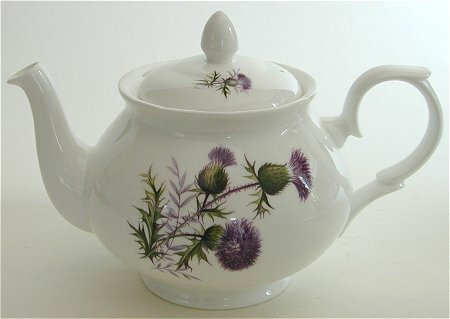 A beautiful thistle pattern adorns this 4 cup teapot by Roberts and Sons. Made in Scotland. A beautiful thistle pattern adorns this 6 cup teapot by Roberts and Sons. Made in Scotland. Fine bone china teacup and saucer. 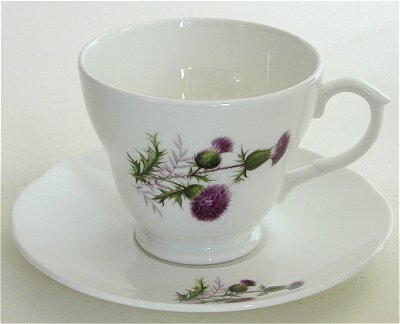 A beautiful thistle pattern is on both the teacup and the saucer. Made in Scotland by Roberts and Sons. The teacup and saucer is the same shape as the one above but does not have the Thistle. Fine bone China made in Scotland by Roberts and Sons.